Beachfront Condo! Beautiful sandy beach! Great views of the lake!! Best value on the lake! Dock use on a 1st come 1st serve basis, plenty of room to park your trailer! 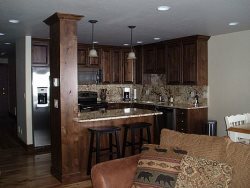 This studio condo is on the second level and overlooks Payette Lake. Access to lake and POOL IN THE SUMMER. Murphy wall bed and a sofa sleeper for a total of 2 beds. TV/DVD. Condo is dated and small but perfect for a couples weekend. (Fireplace is not available for use) Absolutely no pets. Condo Complex has Wifi Internet. Unit does have air conditioning.